Please note that you'll also need additional unsalted butter to grease your skillet. In a large mixing bowl, sift together the flour, sugar, baking powder and soda, and salt (I do this through a sieve, not with a sifter). After melted butter has cooled down, beat the eggs with the buttermilk in a separate bowl then whisk in the melted butter. Using a wooden spoon or a spatula, add the wet ingredients to the dry ingredients and combine just until you have a lumpy batter; do NOT over mix. Over medium-high heat, heat some butter in a large skillet (you could use a griddle too, of course). For each pancake, use a generous 1/4 cup of batter; after spooning batter into skillet, sprinkle top of each pancake with blueberries and press them in slightly. Cook each pancake for approximately 2 minutes per side; the length of time will depend on how hot you have the heat, how well your skillet retains the heat, etc. 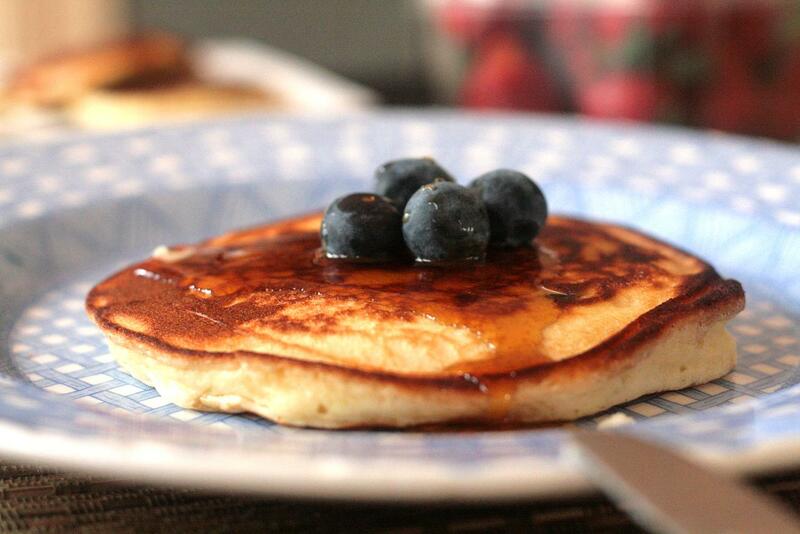 Keep pancakes warm in a low oven as you make them, then serve; best when served with real maple syrup.